Dana Gardner's BriefingsDirect: Open Source and Cloud: A Curse or Blessing During Recession? BriefingsDirect Analysts Weigh In. The productivity and perils of open source software has been a topic pretty much beaten to death. Yet the landscape in IT, as always, is shifting -- because of the recession and because of a white hot interest in cloud computing. It's time again, then, to look at the pluses and minuses of open source software models in the context of tight IT budgets and the advent of cloud-based services for enterprises. 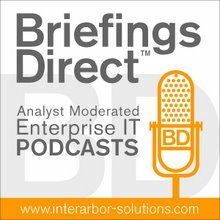 Our latest BriefingsDirect Analyst Insights roundtable discussion, vol. 39, therefore examines open source in the context of economics, complexity, competition, and the disruption of the shifting business models in software. The major question is: Does using open-source software pay off in a total cost sense, compared to commercial offerings today? Furthermore, how will this change over the coming several years as cloud models take hold? Please join noted IT industry analysts and experts Tony Baer, senior analyst at Ovum; Jim Kobielus, senior analyst at Forrester Research; JP Morgenthal, independent analyst and IT consultant, and David A. Kelly, president of Upside Research. Our guests are Paul Fremantle, the chief technology officer at WSO2 and a vice president with the Apache Software Foundation; Miko Matsumura, vice president and deputy CTO at Software AG, and Richard Seibt, the former CEO at SUSE Linux, and founder of the Open Source Business Foundation. Our discussion is hosted and moderated by me. Morgenthal: I believe that open source and noncommercial licensing is a good thing and has been very positive for the industry as a whole. My concern is for the proliferation of free software, that is, the commercial software that businesses use without paying any license and, optionally, only have to pay maintenance for to run their business. They earn their profit using that software to run their business, and yet nothing is given back to the software industry. ... Anytime you have a model where something is given away for free, at some point the free stops. It's very difficult to monetize going forth, because every buy is a buyer's remorse. "I could have had that for free." ... Economically long-term, I don't believe anybody has thought about where these changes stop and what they end up cannibalizing. Maybe we end up with a great market, and maybe we don't. I'd just love to see some attention paid to detail before people just willy-nilly go do these things. What is the long-term impact here? Kobielus: There's a broader range of options for the buyer in terms of how they can acquire this functionality through open-source or commercial licenses, appliances, cloud, and so forth. ... Open source has been a good parasite. ... Innovation is going like gangbusters, but the business model of being a pure software vendor based on pure commercial licensing is dying out. Matsumura: Complexity is a really powerful force in the economy and in enterprise software in general. One of the things that open source is doing is helping to simplify some of the infrastructural components and to decrease the overall condition of heterogeneity. ... We have learned that in the business of service-oriented architecture (SOA) and business process management (BPM) -- which are called middleware businesses -- is that chaos is perpetual, in the sense that there are two major driving forces in the economy: competition and consolidation. If you do something interesting and innovative, whether you are open source or not, if you partner with your customers and really add value, then they will pay you, whether or not your license forces them. The license is a blunt instrument. ... To me, that's something that was abused by software companies for many years. What open source is doing is sorting the wheat from the chaff. It's sorting out, "Is this something that is a commodity that I don't want to pay for, or is this something that has real value and is innovative, and that I need the support, the subscription, and the help of this company to help me implement?" Open source is moving up the stack and has reached the SOA level. Large corporations are using open-source SOA frameworks, because they want to be fully independent from any vendor. They trust themselves to develop this piece of software together with the bigger community, which becomes a community of enterprises. Innovation is not only from startups, but it's from large corporations, as well. As you look at cloud computing, some of the initiative that we saw with original open-source roll outs over the past 10 years has been almost mitigated. ... My question really is how far can the open-source innovation go. As organizations move into business processes and business-driven value, all the executives that I talk to don't want to focus on the lower-level infrastructure. They want to focus on what value this software is giving in terms of supporting my business processes. ... They don't want to be in the software-development business. How far can open source go up that stack to the business process to support custom applications, or is it always going to be this kind of really lower-level infrastructure component? That's the question that I think about. Morgenthal: The cloud actually hides a whole other layer of the "what and the how" from the user and the consumer, which could work in favor of open source or it could work against open source. ... As long as that thing works, it's reliable, and can be proven reliable, it can be put together with chewing gum and toothpicks and no one would know the difference. Matsumura: We're already beginning to hybridize. Even with customers who are acquiring our technology, our technology takes advantage of a lot of open-source technologies, and we have built components. As I said, we're very selective about how we choose to make our investments. Fremantle: Most open-source software is not free. If you want the same things that you get from a proprietary vendor -- which is support, bug fixes, patches, service packs, those kind of things -- then you pay for them, just as you do with a proprietary vendor. The difference is in the partnerships that you have with that company. There is an opportunity here to build frameworks that really scale out. For example, you may have an internal cloud based on Eucalyptus and an external cloud based on Amazon. You can scale seamlessly between those two, and you can scale up within your internal cloud till you hit that point. Open-source software offers a more flexible approach to that. Kobielus: In many ways, the cloud community, as it grows and establishes itself as a viable business model, will increasingly be funding and subsidizing various open-source efforts that we probably haven't even put on the drawing board yet. That will be in a lot of areas, such as possibly an open-source distribution of a shared-nothing, massively parallel processing, data warehousing platform for example. Things like that are absolutely critical for the ongoing development of a scale for cloud architecture.